Choose a "Référence" rental, verified by a Destination Ile de Ré touristic advisor. « Références » is the guarantee of a warm welcome, maintenance and quality equipment. Nice surroundings. One-floor house of 55m² with a living-room with a bed-settee, a kitchen, 1 bedroom with 1 double bed and one single bed, 1 shower room, 1 wc, a closed garden and a terrace. Situated 5 minutes from the beach of Le Petit Sergent, and 10 minutes from the centre of the village of Le Bois Plage en Ré, our holiday residence boasts 17 independent houses Classified 3 stars ! Detached house close to the beach and shops, very well equipped in a quiet area. Entrance on large living room with kitchenette (dishwasher, washing machine) , satellite TV, wifi, DVD player. 1 room with 1 double bed in 160, bathroom, toilet, parking, terrace and garden, barbecue, holiday checks. Are you looking for a rental for your next stay on the Ile de Ré? 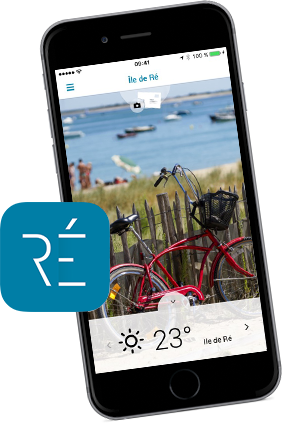 Take the time to choose your future holiday destination on the Ile de Ré! Each village has its own rentals, beaches and activities! It is up to you to choose the "Référence" rental offer that best meets your expectations: villas, rental with swimming pool, apartments, typically restored houses, studio, etc. All "reference" rentals are unique, checked and classified as furnished for tourism. This classification of tourist accommodation complies with specific procedural rules allowing us to guarantee the quality and comfort of the rental. We guarantee you a quality service and a commission-free booking with no booking fees. For further information, you can contact us on +33 (0)5 46 09 00 55 for personal advice.